Back in March 2014 I released an AngelList hack that helped create a simple sales funnel of investors from any given city. While the hack got a good amount of traffic and did a good job of organising your leads it was still just a hack. The hack didn’t really help you prioritise what investors to get in touch with. It didn’t give much of an overview or allow you to filter by specific types of investors. Last but certainly not least it didn’t help you find a good way to get introduced to the investor you wanted to get in touch with. The more transparent the market for investors is, the more bargaining power the entrepreneur will have. The more localized the investor is, the easier it is to get a face-to-face meeting – I always emphasize that these are essential. The less time a founder has to spend on browsing for investors, the more time he or she can spend building a great product or get more traction which is where the real value is created. The better the connection a founder can get to a potential investor, the better the chances are that the investor will get back and be willing to meet. The better the match between a founder and an investor is, the better the relationship will be in years to come. The tool I set out to build was suppose to be as simple and intuitive as possible, while still showing the necessary information to make a decision about adding an investor to the list of potential leads. Location. The site starts by showing you investors in the closest big city by using your computer’s location (currently only London and Copenhagen is available, but we will soon add more cities). If you are a 100 km away from London it will show you investors from London since this is the closest city with a big concentration of investors. If you are physically located in one city, but would like to see investors from another place, then simply change the location. Please notice that smaller cities are not included at this stage. Favoriting and exporting. When you have found a suitable investor then simply press the star to save them to your list of favorites. To the right of the search bar you will see an indication of how many investors you have starred and by pressing that button only the starred investor will be shown. Now you have the option to export all your starred investors and get them in a nice excel sheet. 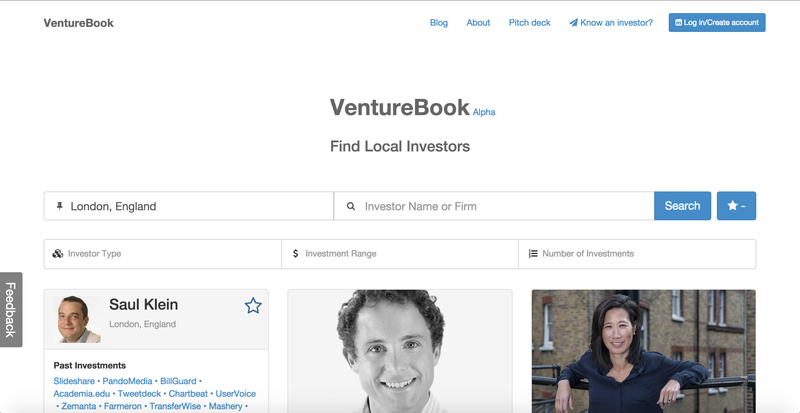 This way you will end up with a curated list of the investors for you to get in touch with. Introduction (coming soon). Now its time to get in contact with the investors and this is where the real magic of the tool comes into play. The site will ask you to log in with Linkedin before you will be able to access this information. The reason is that we need to use your Linkedin contact list to figure out how we can give you the best possible introduction. You will see these people presented underneath the general information in a prioritized order. When you have found the person you think is the most suitable to help you out with an introduction simply press the mail button and you will be taken to the in-mail system within Linkedin where you can get in touch. Pitch deck. Once you are in contact with the investor it’s time to send them your awesome looking pitch deck. To get this nailed you can get help from our friends from Pitchxo, who have created a tool for exactly this purpose. Simply press the Pitch deck button in the top left menu and you will be redirected. Feedback. The site is still in alpha so there might still be a few bugs and very likely still a lot of things that can be improved. That’s why the only thing we ask in return for using this tool is your feedback. So please press the feedback button in the left menu and use 2 minutes to tell us about your experience with the site and what things you would like to see us add in the near future. Get that check. For now it will be up to you to get on the investors radar and get them to sign that check for a million bucks, but hopefully soon we will be able to help you with this part of the process as well. Stay tuned to the blog for more stuff to come or simply sign up to the site and we will keep you updated via email. We never spam or use any of your information for purposes outside the scope of the site. ← What tech investors look for – 6 great VC’s in the hot seat!